Yesterday we were blessed with another afternoon of decent weather so we decided to tackle another hike at Mt. Carleton Provincial Park. As the starting point was in the same area as we visited yesterday, we decided to take the alternate route around the lakes. Starting down the road, we noted the no trailers sign. Not being a trailer, we assumed we were fine. All of the roads in Mt. 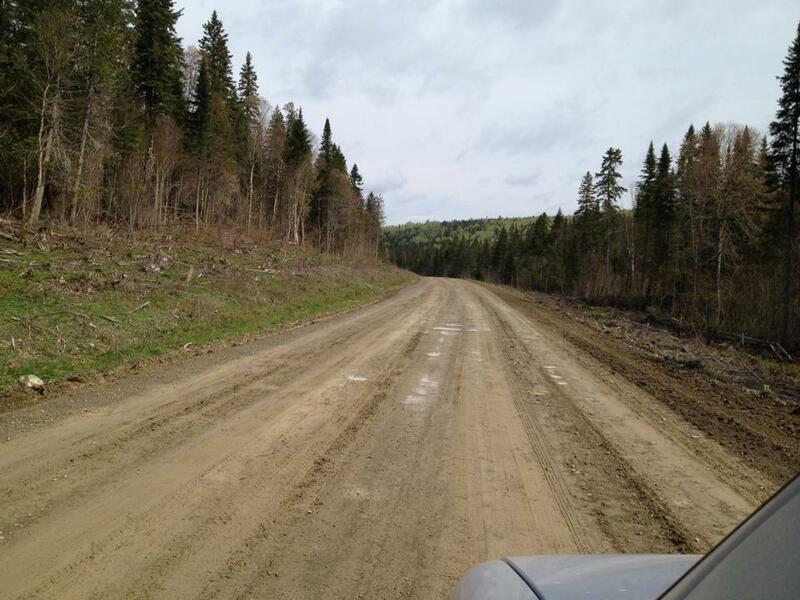 Carleton are unpaved and not all of them are in the greatest of shape so we weren’t expecting a smooth ride. 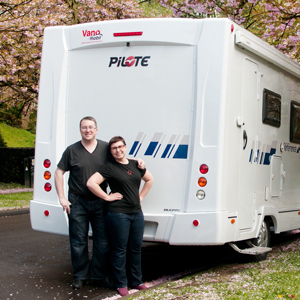 As the road became narrower and narrower the reason for the no trailers sign became obvious and likely is meant to apply to motorhomes too. As we were too big to turn around there was nothing for it but to keep going. I had all my digits crossed we wouldn’t get stuck, blow a tire, or meet something coming the other way. Luckily we made it through unscathed. Lesson learned – no trailers sign = no Yeti either. The only other trail rated ‘easy’ in Mt. Carleton and accessible via motorhome was the Portage Trail. It’s over 4km one way so we knew we weren’t up for the entire trek. We did a short section (but longer than the previous day’s hike – baby steps). 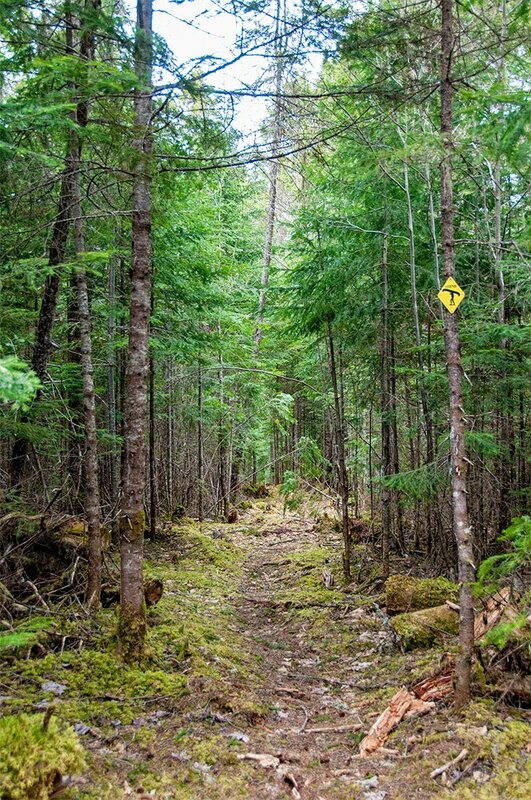 The Portage Trail is relatively flat when you compare it to other trails at Mt. Carleton, as many of them scale mountains, but it was still pretty rugged. To make matters more challenging the path was still littered with a lot of debris from last winter’s ice storm. There were downed branches as well as entire trees everywhere. We decided if this was rated an ‘easy’ trail, we definitely aren’t yet ready for the ‘challenging’ trails. We saw lots of evidence of moose including huge footprints following the trail as well as moose, erm, leavings. We didn’t spot any other wildlife though. It was a nice hike and not too challenging for only our second day out. 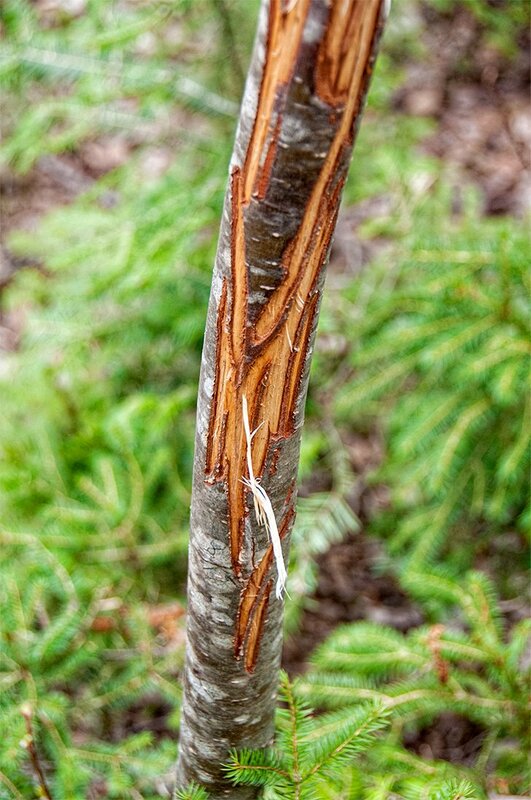 We were debating if these were claw or antler marks. Any ideas? After our hike, we returned to the campground once again just as the rain began. Our plans for a BBQ quickly changed to oven roasted chicken thighs, potatoes, slaw, and garlic mushrooms. We had a quiet evening (except for our neighbour’s noisy generator) reading our books and unwinding. This morning we were up fairly early and Andrew whipped us up a hearty breakfast, then we packed up Yeti and left the park to continue along the Appalachian Range Route. Leaving the park, we both confirmed we’d love to return to Mt. Carleton in the autumn for more hiking and leaf peeping as the view from the mountains should be spectacular. Moments after leaving the park and returning to the ‘main road’ to Saint Quentin, it turned to gravel, then the gravel turned to dirt or more precisely mud. In fact, this short (thankfully) section of the Appalachian Range Route is worse than any of the roads we travelled on in the Provincial Park. Luckily, we didn’t see any other traffic on the dirt section other than a road grader, who was definitely making the road smoother, but also muddier. Thankfully this only lasted for a short section but really… this is the Appalachian Range Route? Back on the pavement we could appreciate the views. 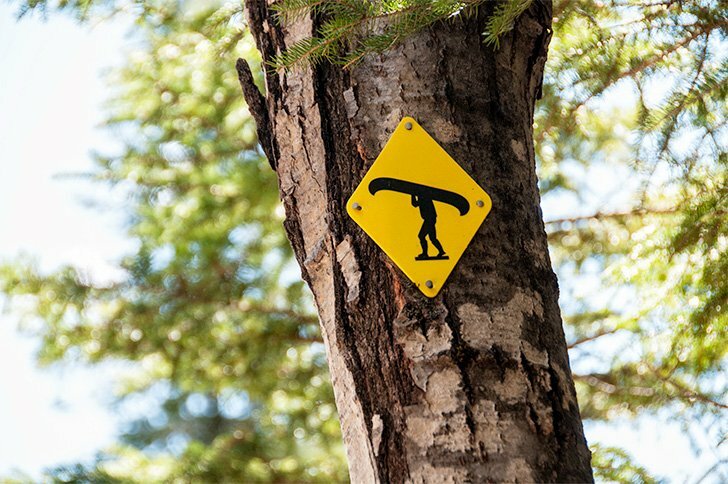 This is still remote country and the only signs of humanity are the logged sections – and there are lots of them. Forestry is the lifeblood of this part of New Brunswick but after spending four days in pristine nature, it’s hard to see such a destructive impact on the forest. The balance of humans and nature is always a complicated one. We made a short stop in Saint Quentin and were surprised to find a lively and prosperous looking town. It’s the maple syrup capital of New Brunswick and also home to a huge Western Festival every summer. I would have liked a bit more time to explore but we needed to press on to Campbellton. We enjoyed the drive over the hills through more small towns. Andrew spotted another moose on the side of the road, bringing his total up to three. We still don’t have any photographic evidence though. 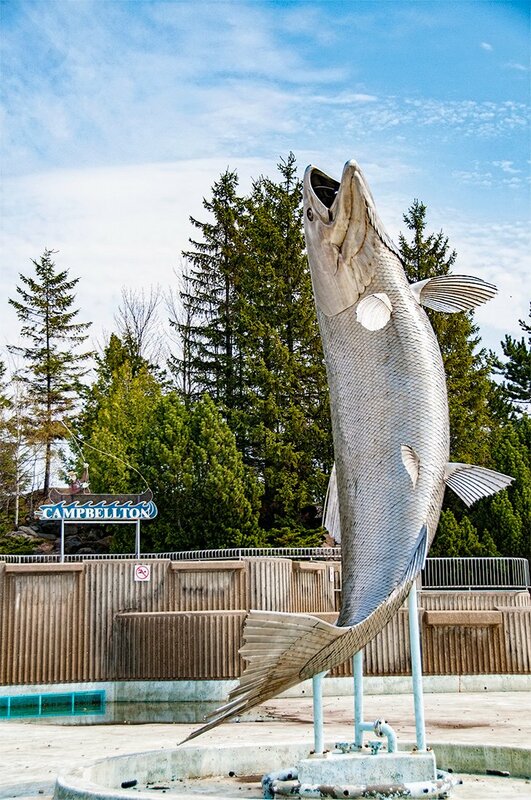 Arriving in Campbellton we took a quick cruise through town and stopped to check out Restigouche Sam, a giant salmon statue near the river. Sam was big and shiny but unfortunately, his pond of water hasn’t yet been filled for the season and the info centre next door is still closed. 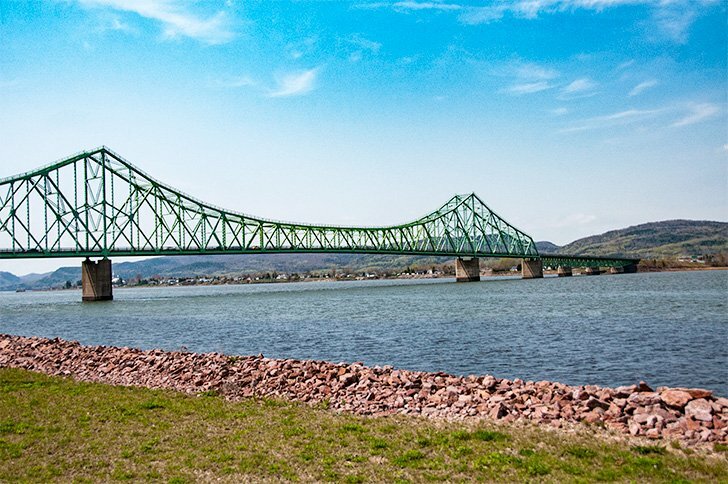 There is a lovely walkway beside the Restigouche River and we took a quick stroll to admire the view. 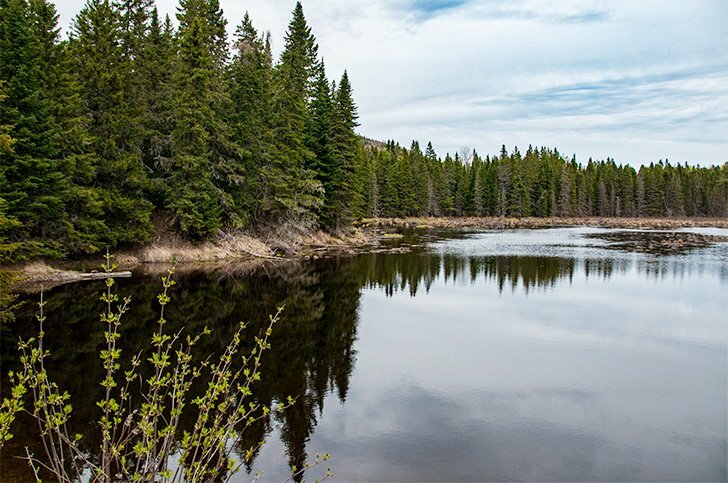 The other side of the river is our destination in a few days – Quebec’s Gaspé Peninsula. Tonight though, we are staying chez Uncle Wally, in the Campbellton Walmart parking lot as our final New Brunswick stop doesn’t open until tomorrow. In the morning, we’ll be moving to another Provincial Park we’ve not visited, Sugarloaf. I’ve skied the hill once many, many moons ago but have never visited the park in summer. 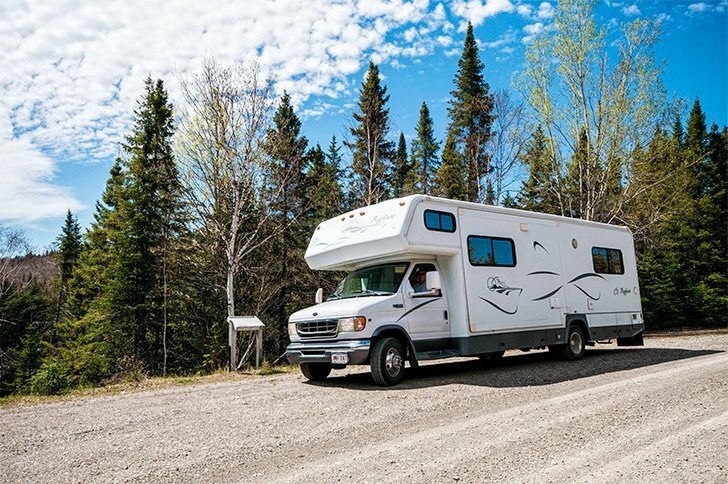 We’ll spend three nights at Sugarloaf before we cross the border into uncharted territory in Quebec.